Mom was telling me this morning that one of her friends was complaining about the rain in Louisiana and she thought they should come to Washington sometime. We have had a bit less than we usually get this year, but when it rains, it still pours. For the next five days we are supposed to get sunshine. I can’t wait! I wish it could last longer, but the rain keeps things green around here and in light of how things have been going in places like California and Texas, I won’t complain. This is one of my other collages. It is done – for now. I almost ran out of matte medium, my collage adhesive of choice these days. 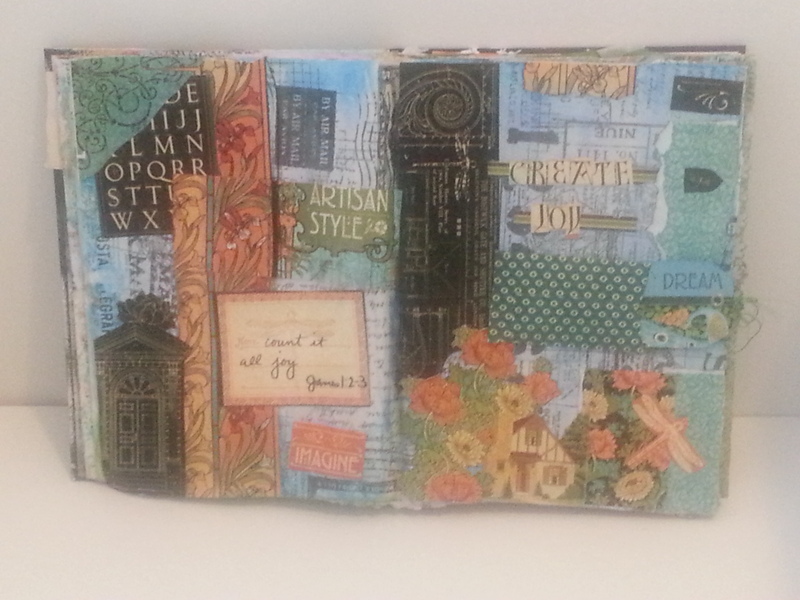 I use mod podge for most of my 3-d decoupage projects but the matte medium works better for me with the journals. I have started on my latest Inspiration Wednesday and I know I will have fun with it because I always do. I saw a couple of interesting prospects for craft projects while I was out and about yesterday, but my mind is still open.